Cuneiform was the first written language. It was invented by the Sumerians in roughly 5,000 BC. 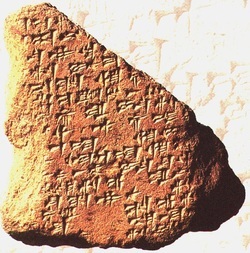 Cuneiform was written in clay. Even after the fall of the Sumerians, other civilizations used cuneiform as their way of writing. The earliest wheels were invented in about 3,500 BC. The earliest form of wheels were rollers placed underneath heavy objects to roll them along. After that, people discovered that placing rollers under heavy objects made it even easier to move them. Eventually, these runners and rollers evolved into the wheels that we use today. Irrigation was also invented in Mesopotamia, because southern Mesopotamia was dry and there was not enough rain to grow crops. People dug trenches so that water flowed to water their crops. The ancient Babylonian king Nebuchadnezzar so that his wife would have a lovely garden to enjoy. fountains and gorgeous flowers, all build to make a homesick queen feel welcomed and loved." Ziggurats were huge temples built by the Sumerians to honor their gods. They were huge temples with steps leading up to the top. At the top, priests placed offerings of food and other goods. Mesopotamians also invented sailboats, checkers, and chariots. These inventions made it possible for people to communicate and get around better. They helped create more efficient ways of watering plants to grow more food, so that more plants could be grown and more people could live in Mesopotamia. All of these inventions helped create better inventions for the future.